VILLAMENA -Christophorus Clavius Bambergensis e societate iesu aetatis suae anno LXIX. VILLAMENA, F. - Christophorus Clavius Bambergensis e societate iesu aetatis suae anno LXIX. Christophorus Clavius Bambergensis e societate iesu aetatis suae anno LXIX. - VILLAMENA, F.
Title : Christophorus Clavius Bambergensis e societate iesu aetatis suae anno LXIX..
Map maker : VILLAMENA, F.. Size : 13.4 x 8.5 inches. / 34.0 x 21.5 cm. 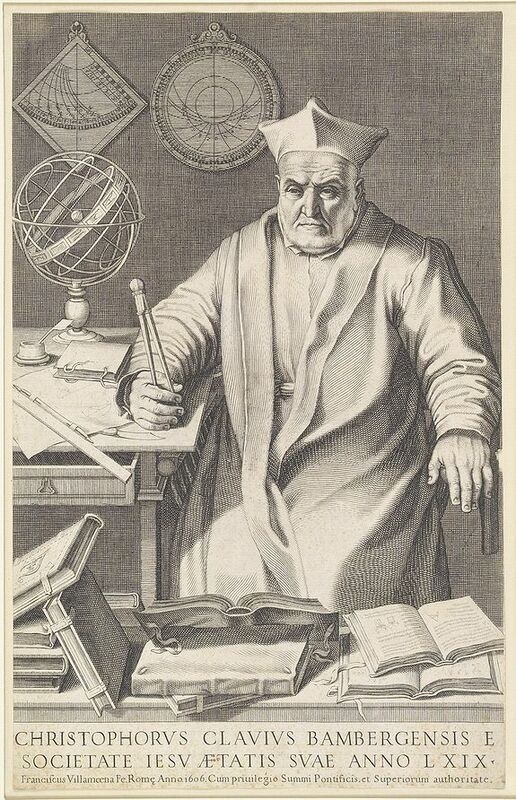 Description :Rare portrait of Christopher Clavius or Clau (March 25, 1538 – February 12, 1612) was a German Jesuit mathematician and astronomer who was the main architect of the modern Gregorian calendar. In his last years he was probably the most respected astronomer in Europe and his textbooks were used for astronomical education for over fifty years in Europe and even in more remote lands (on account of being used by missionaries). Clavius joined the Jesuit order in 1555. he went to Italy and studied theology at the Jesuit Collegio Romano in Rome. In 1579 he was assigned to compute the basis for a reformed calendar that would stop the slow process in which the Church's holidays were drifting relative to the seasons of the year. Using the Prussian Tables of Erasmus Reinhold, he proposed a calendar reform that was adopted in 1582 in Catholic countries by order of Pope Gregory XIII and is now the Gregorian calendar used worldwide. Condition : Cut on the plate mark. Dark impression.